Health insurers that sold plans and lost money on the Affordable Care Act's exchanges in 2014 will receive only a portion of their promised safety-valve payments, according to government data released Thursday. 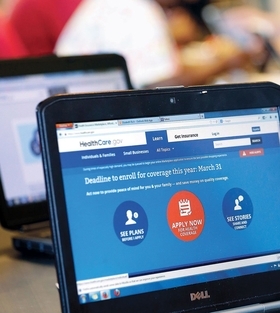 The $2.5 billion still owed to insurers could be covered in 2015 and 2016. But if that doesn't happen, the agency will have to work with a Congress led by Republican members who remain hostile to the ACA to cover those remaining funds. Some smaller companies could experience “solvency and liquidity challenges” as a result, although the CMS said those would be isolated cases. The healthcare reform law established three “market stabilization” programs to help insurers weather the first few years of covering a new population with unpredictable healthcare needs. At issue is the risk corridors program. The government had planned on releasing risk corridors data in August but waited until Thursday due to discrepancies in the data. The risk corridors program, which expires at the end of 2016, essentially limits how much money an insurer can lose or gain on its exchange plans. For example, if a health plan's actual medical claims exceeded expectations by more than 3%, the government will reimburse half of those losses. If claims surpassed expectations by more than 8%, CMS will pay 80% of the losses. It also works the other way. Health plans that recorded medical claims that were 3% less than expected will have to pay half of the profits back to the government. In 2014, insurers paid $362 million into the program, but they also requested $2.87 billion in payments to cover their losses. The CMS will only reimburse 12.6% of the payment requests, meaning insurers will still be owed more than $2.5 billion. Names of companies that paid and are owed money were not released. The remaining risk corridors payments will be paid out of the 2015 and, if necessary, 2016 collections, senior CMS officials said. If there is still a shortfall after the third year, then HHS will “explore other sources of funding” and potentially work with Congress to make insurers whole, officials said. Congress may be unwilling to help the Obama administration. Republicans have railed against the risk corridors, calling them “massive bailouts” for health insurance companies. Industry experts, though, have said the risk corridors are necessary to help balance the premium risk of the new marketplace enrollees. A handful of co-ops, created by loans authorized by the ACA, have folded this year in large part due to financial instability and a sicker-than-average patient population. CoOportunity Health, which sold plans in Iowa and Nebraska, was the first to shut down operations. The co-op predicted it would not receive $60 million in risk corridors payments. The ACA's other two risk programs are reinsurance and risk adjustment. The temporary reinsurance program paid insurers $7.9 billion for 2014 claims. The permanent risk-adjustment program pooled $4.6 billion among companies. Both of those programs are revenue-neutral and will not affect the federal budget.